Skarmory in game: 6,002 Who? Important notice! Pokemon Skarmory is a fictional character of humans. Its steel wings become tattered and bashed in from repeated battles, but once a year the battered wings grow back completely. This process restores the cutting edges. Its feathers are sharp enough to be used as blades. Its skin and feathers are solid because it lives and is raised in very harsh conditions. Its nests are usually found in thorn bushes, where continual scratching of its skin will eventually harden it into an iron-like state. Skarmory made its anime debut in Hot Matches! It belonged to a Trainer named Miki, who was looking to battle any Fire-type Pokémon. She used it to battle Brock's Vulpix and Ash's Cyndaquil. 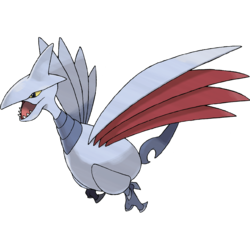 Skarmory was one of the Steel-type Pokémon that were picking on a wild Torkoal in All Torkoal, No Play. A Skarmory kidnapped May and dumped her in a Forbidden Forest in Grass Hysteria!. Winona's Skarmory was in Who's Flying Now?. She was letting people take rides on it during the Feather Festival. Barry owns a Skarmory, which he used in his battle against Paul in Casting a Paul on Barry! at the Lily of the Valley Conference. It was able to use Spikes, but was easily defeated by Paul's Magmortar. 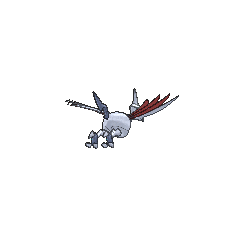 A Skarmory appeared in Battles in the Sky!, under ownership of a Sky Trainer. Six Skarmory appeared in The Legend of the Ninja Hero! under the ownership of the Ninja Army. They reappeared in the next episode. Attila owned a Skarmory in The Legend of Thunder!. A Coordinator's Skarmory appeared briefly in Spontaneous Combusken! taking part in the Chrysanthemum Contest. Several Skarmory appeared in Steeling Peace of Mind! and Saving the World From Ruins!. Taylor's Skarmory appeared in Pursuing a Lofty Goal! as one of the participants of the Squallville PokéRinger. Several Skarmory appeared in Pillars of Friendship!, under the command of J's henchmen. A Skarmory appeared in the opening scenes of Zoroark: Master of Illusions. A Skarmory appeared in the Hoopa's Surprise Ring Adventures short Flying in the Air. A Trainer's Skarmory appeared in A Relay in the Sky!. EP152 Skarmory Ash's Pokédex Skarmory, the Armor Bird Pokémon. 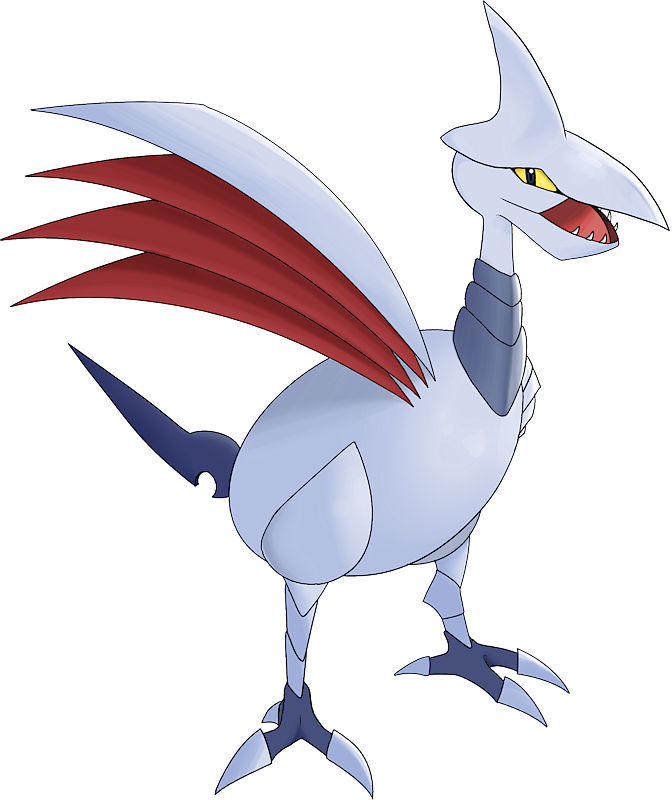 Because Skarmory nests in briers and is constantly scratched by thorns, its wings become razor sharp. Gold helped Falkner capture a Skarmory in Sunkern Treasure by using his new caught Sunkern to leap near it to let Exbo attack it with its Ember. Falkner then passed the Gym Leader test using it, becoming the new Gym Leader of Violet City. Falkner's father, Walker, owns a Skarmory in Scrappy Skarmory, he rode it to visit Chuck in Cianwood City. He was attacked by Suicune on the way so he teamed up with Chuck in an attempt to capture it, but failed. Another Skarmory appeared in The Last Battle XIII as one of the Pokémon sent to help the fight in Ilex Forest. Winona is later seen with a Skarmory, which she used to battle Team Aqua. Carr used a Skarmory to escape from Team Rocket's airship in the FireRed & LeafGreen chapter. Skarmory was the first rental Pokémon used by Emerald in his Battle Factory team. 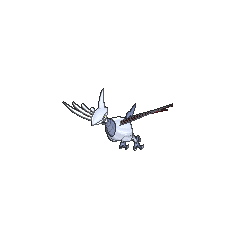 Skarmory can be seen as a parallel to Mantine. Both of them are Flying-type Generation II Pokémon. Skarmory is exclusive to Pokémon Silver, FireRed, and SoulSilver, while Mantine is exclusive to Pokémon Gold, LeafGreen and HeartGold. Skarmory has kidnapped more Pokémon and people in the anime than any other Pokémon, with the possible exception of Meowth. It has kidnapped Jessie's Wobbuffet, May, an Azumarill, and Meowth in the regular series, and it also kidnapped Diglett, Pichu and Pikachu in the Mystery Dungeon special. Skarmory has much in common with the Andean Condor and cranes, birds which are held in high esteem in Japan. It is also similar to many mythological, metallic birds such as the Stymphalian birds, the Gagana, and the Alicanto.